The owners and operators of stores, restaurants, malls, and other public places are legally obligated to maintain their facilities in a safe condition and protect the public from having a slip and fall or trip and fall accident and suffering personal injury. If they fail to protect you from an accident you may have a claim for personal injury, and you may be entitled to recover money for your medical expenses, lost wages, and pain and suffering. 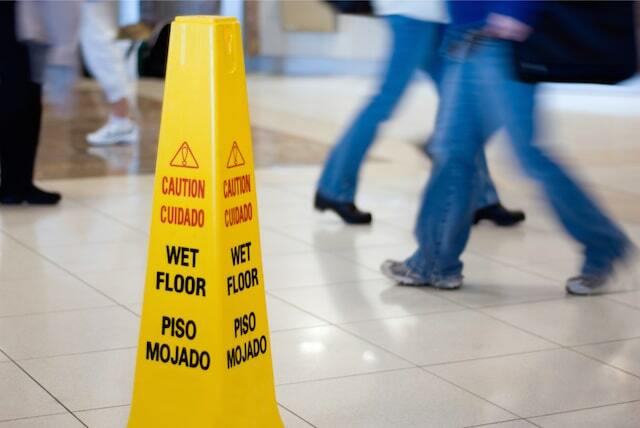 Slip and fall and trip and fall accidents are a common occurrence in public places. If you are involved in a slip and fall or trip and fall accident and suffer personal injury we will pursue your personal injury claim. There are several things you must do in order to protect your personal injury claim if you are involved in a slip and fall or trip and fall accident in a public place. First, you should call for help and make sure the store employees are aware of your accident. In most cases, the store will investigate your accident and document it with an accident report. However, you should not sign anything given to you by the store. You should listen carefully during the store’s investigation of your accident and take note of any employee comments such as “it happened again” or “why didn’t we get this cleaned up sooner”. As the store employee is investigating the accident, you should also inspect and, if you are able, take pictures of the area where you fell and the substance that you slipped or trip and fell before it is cleaned up. This is very important because as part of your personal injury claim you will need to prove that the store knew or should have known that the substance was on the floor for enough time to clean it up before your slip and fall or trip and fall accident. For example, if you slipped on spilled soda, you will want to inspect the area and determine whether there are any visible shopping cart tracks in the soda or whether the floor has become sticky from the soda. This sort of evidence is crucial to proving your personal injury claim. You should also write down the names and phone numbers of anyone who witnessed your slip and fall or trip and fall accident. You should also get the names and phone numbers of anyone who is in the same aisle or area as you even if they did not actually see you fall. Finally, seek immediate medical attention for your injuries and contact us to pursue your personal injury claim. The Berman Law Firm is a Miami personal injury, civil rights, and abuse victim’s law firm. We passionately represent victims of personal injury, civil rights violations, and other abuses in Miami and throughout South Florida. We want to help you and will fight for you to maximize your recovery and help you heal from the physical and emotional pain of personal injury, civil rights violations, wrongful death, or abuse. Contact us now for a free consultation with a Miami personal injury and civil rights lawyer. We serve clients throughout South Florida including Miami-Dade County, including Aventura, Brickell, Coral Gables, Doral, El Portal, Fontainebleau, Hialeah, Homestead, Kendall, Miami, Miami Beach, Miami Lakes, Miami Shores, North Miami, Perrine, Pinecrest, Palmetto Bay, Redlands, Tamiami, and Westchester, Broward County, including Deerfield Beach, Fort Lauderdale, Hallandale Beach, Hollywood, Lauderhill, Lighthouse Point, Pembroke Pines, Plantation, and Weston, and Palm Beach County, including Boca Raton, Lake Worth, Palm Beach Gardens, Royal Palm Beach, Wellington, and West Palm Beach.